Dr. Berhe G. Tekola, a national of Ethiopia, holds a Doctor’s degree in Veterinary Medicine from the University of Camaguey, Cuba; a Master’s degree in Veterinary Science from l’École nationale vétérinaire de Toulouse, France and a PhD from l’Institut national polytechnique de Toulouse, France on recombinant vaccine development. In 1986, Dr. Tekola started his professional career as Field Veterinarian, then in 1992, he joined the National Veterinary Institute (NVI) of Ethiopia where he worked and led the Institute (Vaccine Production Enterprise) until 2007. 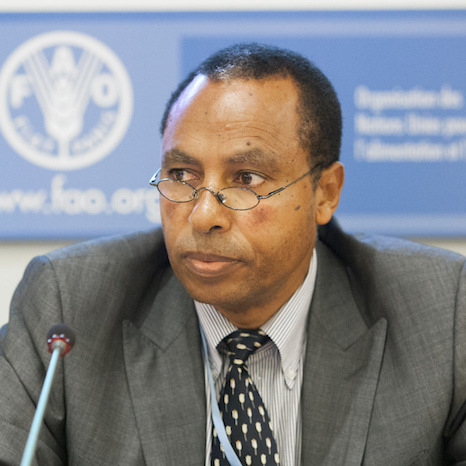 In 2007, Dr. Tekola was appointed to the position of Director, Animal and Plant Health Regulatory Directorate within the Ministry of Agriculture and Rural Development of Ethiopia, until 2011 where he worked on many projects with USAID, EU and different intergovernmental and NGOs; collaborated with the private sector, civil societies; research institutions and academia under the principles of Public Private Partnership. Since August 2011, he joined the Food and Agriculture Organization of the United Nations (UN-FAO) as Director of the Animal Production and Health Division, leading the Animal Health Service (AGAH), the Animal Genetic Resources Branch (AGAG) the Livestock Production Systems Branch (AGAS) and the Livestock Information, Sector Analysis and Policy Branch (AGAL). He and his team strive to address the sustainability of the Livestock sector for the benefit of the livestock keepers (including the wildlife) finding a balance between the livestock/animal and the environment. Currently he is the technical focal point for FAO on the Tripartite One-Health initiative lead by FAO, OIE and WHO.